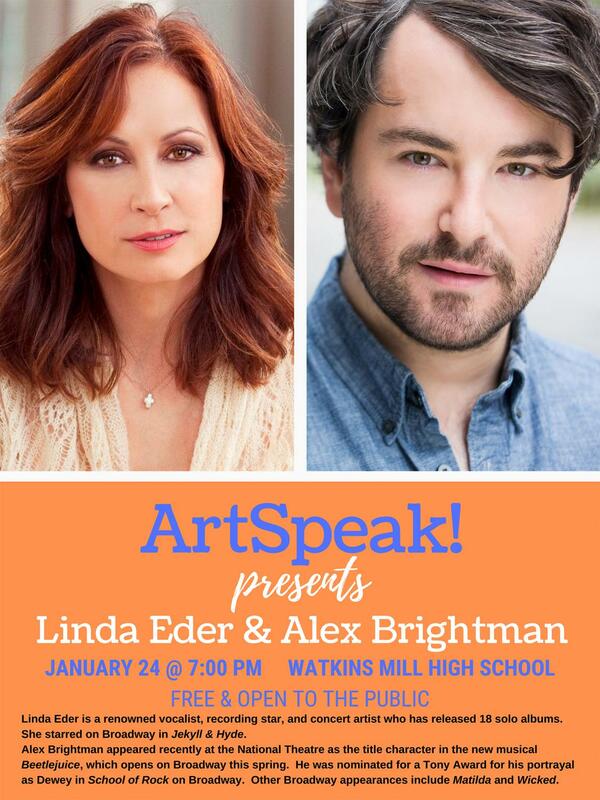 Broadway stars Linda Eder and Alex Brightman will appear on the Watkins Mill High School stage at 7pm tonight as part of the ArtSpeak program. Watkins Mill High School will present its second ArtSpeak program tonight at 7pm in the auditorium, featuring renowned vocalist Linda Eder and Broadway actor Alex Brightman. The event, which brings performing artists to the DC area, will be free and open to the entire community. The program is an initiative by Shugoll Research, a Bethesda-based company, to spark interest in theater and arts. “My sincere hope for hosting this event is that our student body will take advantage of the event, not only to learn more about the theatrical world, but also engage in that part of theater that not all students will be privileged enough to experience otherwise–direct interaction with those people who have succeeded in the arts,” theater teacher Scott Tarzwell said. Montgomery County has hosted celebrities who are often performing in the area through ArtSpeak for over 20 years. To inspire those interested in theater and the arts to continue their path forward, celebrities volunteer their time at schools to share their experiences and knowledge of their career fields. Hosting ArtSpeak “allows Watkins Mill High School to shine throughout the county as a proponent of the arts, and to serve as welcoming hosts,” Tarzwell added. Though the most common requests are actors from recognizable Broadway style shows, guests represent all aspects of the theatrical arts. Guests include dancers, choreographers, singers, wardrobe stylists, musicians, directors, and artists. There are four shows every school year. They last about two hours each, during which guests take questions from the host and audience. The show will also consist of trivia games and performances by the talent. If time permits, the guests may even sign autographs and take pictures with audience members. “I’m really excited to see celebrities here. There’s so many opportunities at our school that not only provide students with information about their interests, but it also nurtures their desire to stay persistent while pursuing them,” junior Perkerti Koirala said. ArtSpeak was last held at Watkins Mill in 2017 with guest stars Patti LuPone, Marvin Hamlisch, and Kristen Chenowith.